You and your fiancee can select from the many beautiful color previews and design your own photographic arrangements from finished photographs in a variety of sizes. Two Wall Portraits up to 16x20 from your engagement or wedding images. 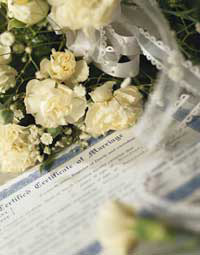 On this plan $500 is applied toward photographs plus all the previews from the wedding day with your choice of finish. Receive a CD of all the image files from the Wedding Day! Receive a CD of all the image from your coverage on wedding day. Additional photographers time $50.00/hr. This does not apply toward photographs. Each bride and groom can mix photograph sizes and placement to customize your wedding story. The cost on each coverage on the Love Story is only the minimum amount required to be spent on photographs. It is to your advantage to bring everyone's order in at one time. Everyone must order the same finish. We suggest the bride and groom select the finish. Custom Portraits do not apply. 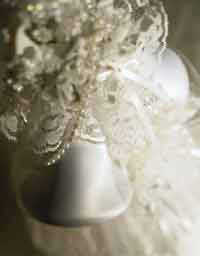 To reserve your Wedding Day a 50% deposit is required. Hand lacquered finish to resist soiling and finger prints. Spotted for glass glare & dust spots. You'll want to display your photographs in your home for friends and relatives to view for years to come. We have a large selection of custom albums in a variety of sizes, colors and price ranges. Who could be more important to you than your parents? And what could be more important to them than your wedding day? 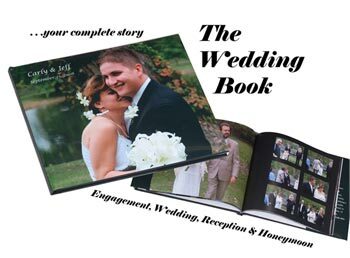 Your parents can order a copy of your Wedding Story Book. The perfect gift for the members of your wedding party, friends, and relatives, the gift they will always remember. Special photographs can be taken of attendants and family, to be slipped into the folio later. Following your wedding there will be many gift-giving occasions such as Christmas, Birthdays and Anniversaries to name a few.